At 508 meters tall it's hard to miss Taipei 101, completed in 1999, which for the span of a decade was officially the tallest building in the world. Now number two after the Burj in Dubai, this imposing sheath of glass, concrete and steel is carrying on quite nicely.Taipei 101 Mall is a plush five-story shopping center which contains a mass of international brand shops, boutiques and inviting restaurants. Located in the Xinyi (Sinyi) District which is Taipei’s busiest and newest trend-setting commercial district, embracing dozens of fashionable malls, restaurants and hotels, such as Shin Kong Mitsukoshi Department Store’s New Life Square and A4 branches, Novel Hall for Performing Arts, New York New York mall, View Show Cinemas, Grand Hyatt Taipei Hotel are just a few of the many places where you can satisfy your consumer cravings. 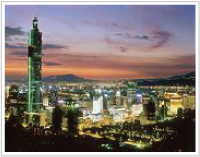 Shihlin Night Market is the one of the largest night markets in Taipei. It is centered on Yangmin Theater and Tsicheng Temple. The night market is formed by many prosperous shops on Wenlin Road, Datung Road andDanan Road, etc. Among them, Shihlin Market was built as early as in 1899 and the market is famous for various snacks and eatery. Many visitors have come to Shihlin Night Market to enjoy the delicious foods, such as large pancake enfolding small pancake, hot pot on stone or Shihlin sausage. Shihlin Night Market has become a renowned place for great foods. Jioufen used to the center of gold mining as In 1890, someone struck gold near Jioufen. It is located within the hills in northeast of Taiwan. The village is next to the mountain and facing the sea. The village once was gold city of Asia and called little Shanghai or little Hong Kong. Along the street there are shops vending the most famous country snack of Geo Fan, yam dish and various local dishes. There are some historical items well reserved. The trip to Jioufen is full of fun and delights. Jioufen has many accommodation places provided by local residents. If you were not in a hurry, you may want to pick a nice inn and stay for the starlight and fishing lights at night. 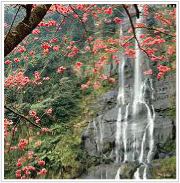 Wulai is a famous mountain village located in water reservation area in northern Taiwan. Residents are most aboriginal people (Tai Ya Tribe). There are high mountains along the intersection of Nanshi Creek and Tunho Creek. Beautiful scenery is formed by the high mountains and running rivers. The place is famous for hot springs, trail train, waterfalls and Yushian Amusement Park. One visiting Wulai would feel like entering into Shangri-La. It is fairies land and a best place for recreation. This is Danshuei's most prominent monument to foreign involvement in Taiwan. First built in 1629 by the Spanish, Fort San Domingo was intended to aid the imposition of Spanish rule over the local Chinese and aboriginal populations in northern Taiwan. This fort was captured by the Dutch in 1642 and they replaced the Spanish-built stockade with a fort made of stone. The fort became known as the "Hung-Mao Castle" (Fort of the Red Heads) in reference to the colorful locks of its Dutch occupants. In 1867, the British leased the fort and undertook massive renovations. Hung-Mao Castle was not repossessed by the government until 1980 when it was designated as a historic site of the first grade. Its position overlooking the mouth of the Danshuei River makes it a particularly attractive scenic spot, especially at sunset.